Tax Planning and Preparation, Business Valuations, Litigation, Tax Representation, Financial Planning, Small Business Partnering, Accounting and Bookkeeping and Computer Software. CPA Ambassador representing the State of Michigan in the profession. Less than 100 CPA's in Michigan have been selected through the AICPA and MACPA. Endorsed Local Provider (ELP) for Dave Ramsey. Denise has been a panelist for thirty plus years on Ask the CPA. She is a frequent speaker on a variety of tax topics and has offered tax tips and authored several articles for local publications. Denise lives outside of Escanaba near the Hyde area, is married to Jim and has three adult children. She enjoys gardening, reading, golfing, kayaking and other outdoor activities with family and friends. 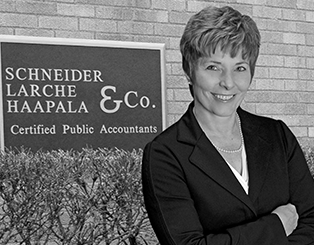 Denise M. Boyle is a Partner with over 35 years of experience in public accounting. She joined the partnership in 1985. Denise is responsible for overseeing the tax work for the firm and serves the firm as the leader of the Tax Practice Quality Control initiative. She is a member of the firm's continuing education committee teaching many of the in-house classes. Denise is also responsible for technology at the firm including internet development and integration planning as well as installation, updating and maintenance of the firms computer network and communication infrastructure. She has extensive computer experience and keeps abreast of current developments in the information technology field. Denise has practiced in all areas of public accounting but is primarily focused on providing business and personal tax planning and preparation services to the firm's clients. Denise's practice areas focus on the beverage industry, insurance, restaurants, builders, manufacturing, trucking, medical and wholesale and retail trades. She does tax preparation for individuals, businesses, estates and trusts, non-profits and employee benefit plans; accounting and problem solving for small business; financial planning for families; and valuations for cases of divorce, gifting, insurance claims and succession planning as well as been an expert witness when litigation was necessary. She has represented clients before the government at both the audit and appeals level. She brings a wealth of experience and knowledge to bear on her clients problems. Denise is an advocate for Financial Literacy and partners with her small business clients solving problems for success. American Institute of Certified Public Accountants (member of tax, valuation and IT divisions), Michigan Association of Certified Public Accountants, American Women Society of Certified Public Accountants, Institute of Management Accountants, National Society of Accountants, and National Society of tax professionals and past president of the Upper Peninsula Chapter of the Michigan Association of Certified Public Accountants. Denise is and has served as member, officer, and director on numerous community boards including Altrusa International of Escanaba, Michigan, Upper Peninsula Quarter Horse Association, Delta county United Way, Delta County Cancer Alliance, Youth Assistance Program (YAP) and St. Thomas finance committee. She was one of the founding members of YAP and for many years served as the Youth Adviser for the Upper Peninsula All American Quarter Horse Congress team as well as Team Mom for many youth hockey teams.